Smartphone usability rating: 3/5. 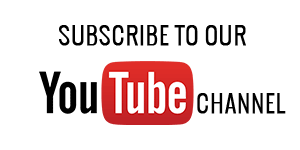 No mobile page for smartphones. You can still finish Lady Foot Locker Customer Satisfaction Survey via smartphone, and it may take you more than 5 minutes to finish. 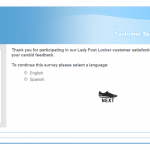 Visit Lady Foot Locker customer satisfaction survey official website. Select answers to questions like "How were you acknowledged?" Select answers to questions like "Did our associate invite you to try on any merchandise during this visit?" etc. Rate your satisfaction on this visit with statements such as "The selection of merchandise" and "The availability of merchandise"
Lady Foot Locker is proud to be your destination for the brands that active women trust and the styles you crave as you live life to the fullest. Abbigliamento giovane e moderno. Negozio anche divertente. fue una experiencia agradable, gracias. Im trying to fill the survey but the page doesn't respond. I just stop to get some shoes and my experience was great! On Friday, March 21, 2014, I visited your Store #06527 located in Boardman, Ohio. I selected a pair of Nike shoes that were on sale. I gave the sales associate two gift cards to pay for my shoes (one was a Visa gift card in the amount of $50.00 and the second was a Mastercard with a balance of $12.77). It was not until the associate told my the balance due that I realized she did not give me the shoes at the sale price. As a result, her supervisor came over and voided the sale. When they rang up the shoes at the sale price, my gift cards would not work as they had voided them when they voided the purchase. The store manager said there was nothing they could do about it. If I wanted the shoes I would have to pay for them. He did say the gift cards would be good in five days he thought. Now I have paid $64.19 cash for the shoes and have not idea if my gift cards will work. I really feel something should have been done since it was not my fault the associate handled the sale improperly. They did say I could wait five days and bring the shoes back and they would try the gift cards to see if they would be accepted. The problem being, I live quite a distance from this Mall and will have a difficult time getting back in five days. I can assure you that I will not purchase anything else from your store nor will I recommend it to anyone. Very good help from Deneice!! At Lady Footlocker Garden State Plaza. Teresa in Arlington was great, and very helpful! thank you Brian and Destiny, of Amarillo you guys was so nice and extremely helpful.